In the above pics you can see the "Undefined" error instead of the Blog Post date. Many blogger blogs get this error. 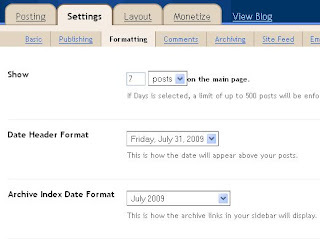 This is mainly due to the default date settings for the blogger blogs. Correcting this error is very simple. First login to your blogger dashboard and go to the blog which is showing the Undefined text instead of the Date. Click on the Settings option and in it go to the Formatting section. In it find the Timestamp Format option. The current selected format will be 8:25 AM or some other time having same format. Now change this time format to Friday, July 31, 2009 or a date having same format. Now click on Save and refresh your blog. You will see that the Undefined error has been replaced by the Date of the blog post.